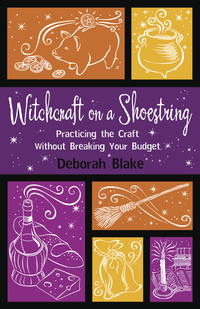 Readers may remember that back in December 2010 I listed Deborah Blake’s book “Witchcraft on a Shoestring” as one of my “favorite” things. In the little blurb I wrote about the book I was quick to point out that it contained a rum cake recipe that I had to try. Then in January 2011, when I tried out Dawn Hunt’s Shepherd’s Pie recipe, I again commented on how I still needed to try out Deborah Blake’s rum cake recipe from “Witchcraft on a Shoestring”. Well, that distant someday has become a reality. Finally, at long last, I tried out the rum cake recipe. I haven’t baked anything cake-like in years. My husband doesn’t like cake, so if I bake a cake, I know it will be me eating the whole damn thing. Even I know that’s not the best plan. I didn’t even own the ubiquitous Bundt pan. However, I recently found myself with plans that involved going over to a friend’s house for dinner and I decided that for dessert I would bring over the rum cake. (For those of you curious, I picked up Jim a bear claw from Panera for him to eat for dessert while we ate cake.) The recipe was pretty simple and fairly straight forward. With Deborah Blake’s permission, I get to share the recipe from “Witchcraft on a Shoestring” with you! Notes: This is one of my favorite special occasion desserts. It takes a little more work than a regular cake, but the results are worth it! If you want to get really extravagant, you can substitute a chocolate cake mix for the yellow one, and Chambord black raspberry liqueur or Grand Marnier orange liqueur for the rum; they are both pretty pricey though. This cake is intended to be made in a Bundt pan, although you could probably use a regular pan. Directions: Grease and flour a Bundt pan. Mix the cake mix, eggs, oil, 1/2 cup rum, and 1/2 cup water. Put nuts on the bottom of the pan, then pour cake mixture over them. Bake at 325 degrees for 50-60 minutes, or until a toothpick comes out clean. For glaze, mix sugar, butter, 1/3 cup rum, and 1/4 cup water in a saucepan. Boil for 2-3 minutes, then pour over cake. Let sit for a while so the cake can absorb the glaze. As I already said, I didn’t own a Bundt pan, but I decided to go ahead and buy one. I couldn’t find a cake mix that explicitly stated it had pudding in it, so I opted for a yellow cake mix from Duncan Hines that was touted as “deluxe extra moist”. Instead of greasing and flouring the pan, we (because although he doesn’t eat cake, Jim still helped me make the cake) just sprayed some Pam butter flavored spray into it. I opted for sliced almonds for the bottom of the pan, and I used olive oil as the cooking oil the recipe called for. And last, but certainly not least, there was the rum to consider. The friends who would be eating this cake weren’t any old ordinary cake consumers, they were rum enthusiasts, complete with one of them already having what is considered THE definitive rum cake recipe. Obviously I carefully considered my rum options. 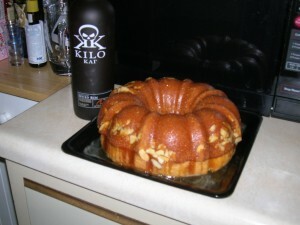 In the end I opted for Kilo Kai rum. The rum is so smooth and delightful you can drink it straight. And when I say straight I don’t mean if you slam back a shot you won’t be left coughing and sputtering, I mean you can actually sit back, sip, and enjoy it. Also, it makes a fantastic rum and Cokes. I highly recommend it. The good news is, I didn’t screw up the cake! The top was little more brown, I suspect thanks to the Pam spray, and the sliced almonds kind of slid to the sides instead of staying on top, but the cake was baked through perfectly and came out of the Bundt pan with ease. I ladled the glaze evenly over the top and then poured the final bit out of the saucepan over it. That said, my clever choice of Kilo Kai rum was perhaps not the best option. Everyone in attendance agreed that the cake was very good, even the owner of the “official” rum cake recipe, but it fell a little short. After careful discussion and consideration, we think that the Kilo Kai rum was actually too smooth for the recipe. The “definitive” rum cake recipe that my friend uses clearly states to use Captain Morgan’s Spiced Rum and no other, and we all now see why. My rum cake was moist, sweet, and tasty, but it lacked that slight kick, that little bit of bite, that alcohol laced desserts need. Overall, Deborah Blake’s “Witchcraft on a Shoestring” rum cake recipe was a big hit! If you try it out yourself, let me know how it turns out! Also, I can’t stress enough how great “Witchcraft on a Shoestring” is, even if you’re not “witchy”. I keep my copy in the kitchen with my cookbooks because there are so many simple recipes in it that I want to try: Tres Leches Pie, Prosperity Pie Quiche, Easy Garden Veggie Pie, Jhaea’s Minty Couscous Salad, Ellen’s Beer Bread, Morgana’s Tomato Pie, and many, many more! If you don’t already own a copy, you can get yours here or at any cool bookstore.